The most important things on using false eyelashes are taking out the lashes perfectly from the case. If you do not know the perfect style of taking out the lashes then it may get distorted and the perfect shape may get spoiled. The best possible way to take the lashes out is placing the fingers on the pair of lashes. It can be easily taken out by pulling the lashes from the center and them finally from the side. This makes you free from any kind of tension. After you are successful in pulling the lashes, you can curl and twirl both the ends form like a curve. This would bring shape to your lashes and make it get fit in your eyes perfectly. You can go for measuring and trimming your eyelashes: It is quite a good idea to perfectly measure and trim the lashes on your requirement. The best way to measure it placing it on your eyelash line and cutting it accordingly. This will also determine that whether you require a small or a big eyelash. On knowing the perfect measurement, you can trim the corners of the lashes to make your eyes look better. Know to apply the glue: Applying the glue is very easy if it is mastered. The glue needs to be coated with the lashes so that it gets glued to the lashes according to the requirement. You need to go on holding the lashes so that it gets fixed. Let the glue in the eyelash get dried up and blow it gently before applying it gently. Know to fix it perfectly with your original lashes: After applying the glue holding it in the position close to the original eyelashes, and then go for placing the false one just at the center to match it perfectly. You can also use a tweezer to fix the lashes in the right position. You must know to secure the lashes: It is a mandatory thing to note down that tweezer is an important thing to fix your lashes. The other side of a simple tweezer can be utilized judiciously to make the positioning rightly. 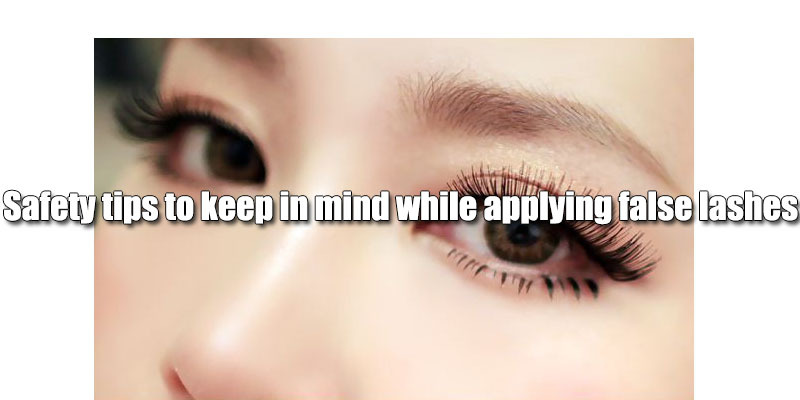 This would also endure the eyelash positioning and make it look perfect. If you want you can curl and pinch the false lashes.After the fixing is done, you can go for pinching the just fixed lashes softly with your fingers. This helps to merge the false lashes with your original ones. Just by using an eyelash curler, you make it look more beautiful and perfect. To make it look more perfect you can use eyeliner in the borders or the upper line of your eye. Removing them is also very easy; you just need to have clean hands so that your eye does not get infected with dust particles present in your hand. Apply baby oil in the joined part as this would soften the adhesive, ultimately removing it.